Who first proposed the idea that birds were descendants of dinosaurs? 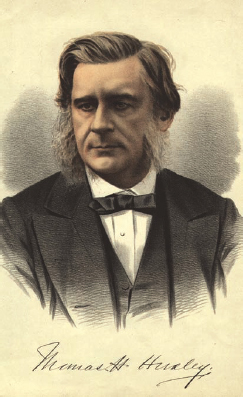 English naturalist Thomas Henry Huxley (1825–1895), an authority on bird evolution and a champion of Charles Darwin’s theory of evolution, first noted characteristics shared by dinosaurs and birds. Huxley observed that a particular species of chicken raised in his area (called a Dorking fowl) had leg bones similar to those of theropod dinosaurs. He also cited as evidence the fossil of a bird-like dinosaur, Archaeopteryx lithographica, discovered in 1855 in Germany. Between 1868 and 1869, using a method of anatomical comparison resembling modern cladistic analysis, Huxley decided birds had descended from dinosaurs. Years later, the Archaeopteryx lithographica represented the transition between dinosaurs and birds, and it was thought of as proof that birds descended from dinosaurs. English naturalist Thomas Henry Huxley was the first to theorize that birds may have descended from dinosaurs (iStock).